There were immediately two things that came to my mind. First was the simple fact that we are not perfect, which means there will always be room for improvement. As believers, our goal is to become more and more like Jesus. John wrote, "We know that we have come to know him if we keep his commands. Whoever says, “I know him,” but does not do what he commands is a liar, and the truth is not in that person. But if anyone obeys his word, love for God is truly made complete in them. This is how we know we are in him: Whoever claims to live in him must live as Jesus did" (1John 2:3-6). Until I live as Jesus lived, there will be room for refining and improving in my life. Now, I don't know about you, but I fall far short of that standard! The second thing that came to mind was another Bible verse. "Why do you look at the speck of sawdust in your brother’s eye and pay no attention to the plank in your own eye? How can you say to your brother, ‘Let me take the speck out of your eye,’ when all the time there is a plank in your own eye? You hypocrite, first take the plank out of your own eye, and then you will see clearly to remove the speck from your brother’s eye" (Matthew 7:3-5). We sure do like to point out faults in other people, don't we? We don't like thinking about our own faults nearly as much, even though we all know those faults exist. We just like to think our faults are more like harmless foibles, while other peoples' faults are glaring character flaws. And yet Jesus calls us hypocrites if we ignore our own faults (the planks in our eyes) while focusing on the faults of others (the sawdust in their eyes). 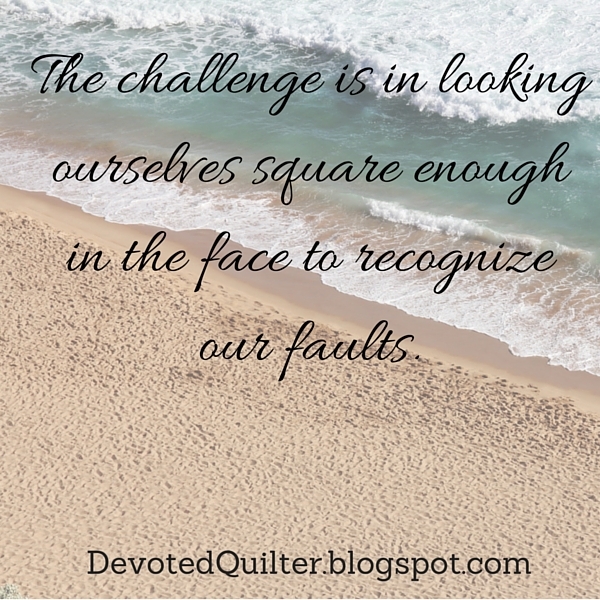 The challenge is in looking ourselves square enough in the face to recognize our faults and then having the courage to do something about them. The amazing thing is, if I work on removing a certain fault from my own life, I'm then more qualified to help someone else overcome that same fault. I'm also more likely to be more compassionate and less judgmental. Make no mistake, there are times when we are called to talk to others about the sin in their lives. Matthew 18:15 says, "If your brother or sister sins, go and point out their fault, just between the two of you." There's a difference, though, between confronting a person about a sin and criticizing them. Often when we criticize it's more a case of nit-picking, of finding fault with the way a person does something because it's different from the way we would do it. In that case, it's better to be more concerned with dealing with your own faults than with nit-picking about someone else's. Welcome back for week 4 of Denim Days! Can you believe it's the last Friday in February already? Time sure does fly when you're having fun, and I've been having so much fun deconstructing jeans and making things from all that recycled denim. Click on these links to see my projects from weeks 1, 2 and 3. I made placemats for us over three years ago and they've been looking rather stained and ugly for a while. I couldn't decide what I wanted to make to replace them, though, so we keep using the old ones. 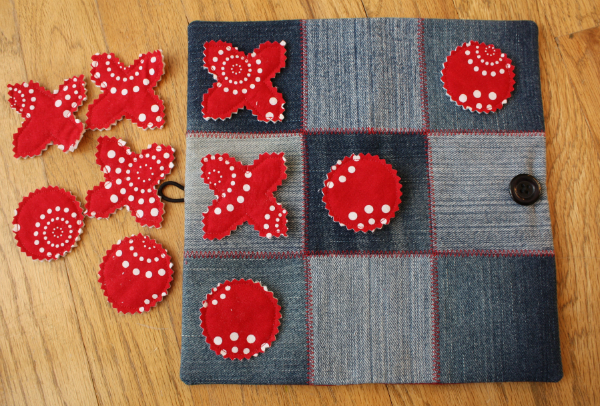 I've always thought denim placemats would look nice, so I finally decided to go for it. 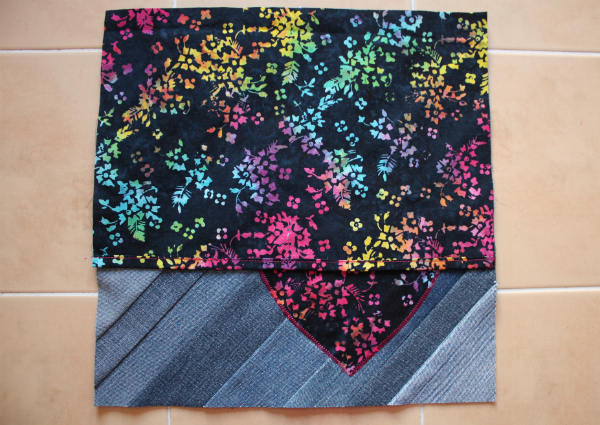 I wanted to use both denim and regular quilting cotton, to reduce the number of bulky all-denim seams, so I chose these two prints, both from Connecting Threads (affiliate link). I love Connecting Threads fabrics (and prices! ), so I'm a little disappointed with the current state of the Canadian dollar, which is making cross-border shopping more difficult. I decided to use a log cabin block, but to make some of the side strips wider so that the placemats would be a rectangle rather than a square. These finish at 12" x 18 1/2". My intention was to have the placemats finished before my parents arrived for their visit this week, so we could use them, but that didn't work out. Though I have all 8 tops finished, only 2 are quilted and bound. But hey, at least I had 2 done so I could get pictures for today, right? *Strips of denim from old jeans in a variety of colours. I would recommend not using thick denim. I had one pair of men's jeans that was noticeably thicker than the rest and it made for bulkier seams. You can read about how I deconstruct my jeans in this post. Black print - 1 square 2 1/2" x 2 1/2"
2 rectangles 3" x 8 1/2"
2 rectangles 1 1/2" x 13 1/2"
Yellow print - 2 rectangles 1 1/2" x 4 1/2"
2 rectangles 1 1/2" x 6 1/2"
Denim - 2 rectangles 1 1/2" x 2 1/2"
2 rectangles 1 1/2" x 4 1/2"
2 rectangles 1 1/2" x 8 1/2"
2 rectangles 3" x 10 1/2"
2 rectangles 1 1/2" x 18 1/2"
Unfortunately, I completely forgot about taking pictures for this tutorial, so we'll just pretend these pictures were taken in progress, okay? 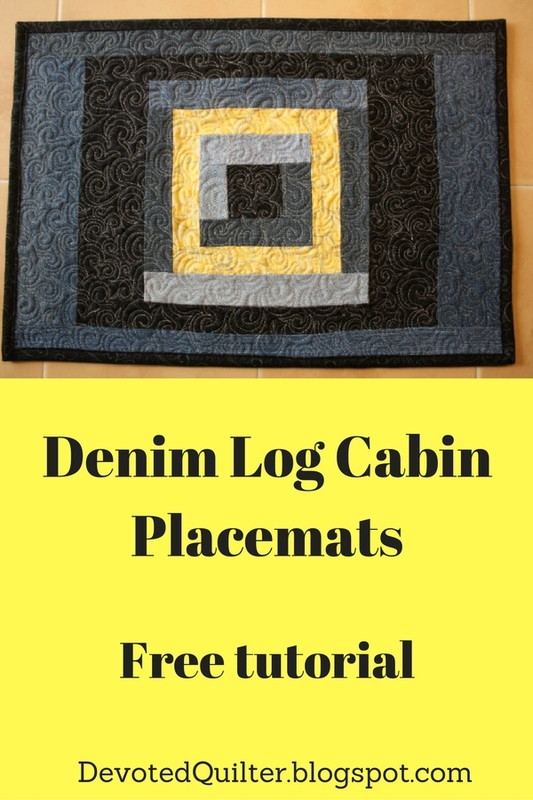 Thankfully, log cabin blocks are easy to take step-by-step pictures of after the fact. 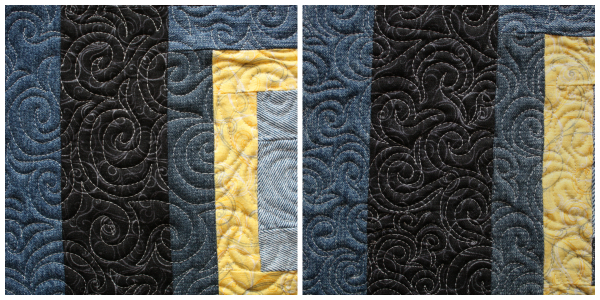 At first I tried pressing all the seams towards the quilting cotton, but I found that at the corners of each border there were a lot of layers of denim, which made for a large bump. Pressing the seams open made for a much flatter block. 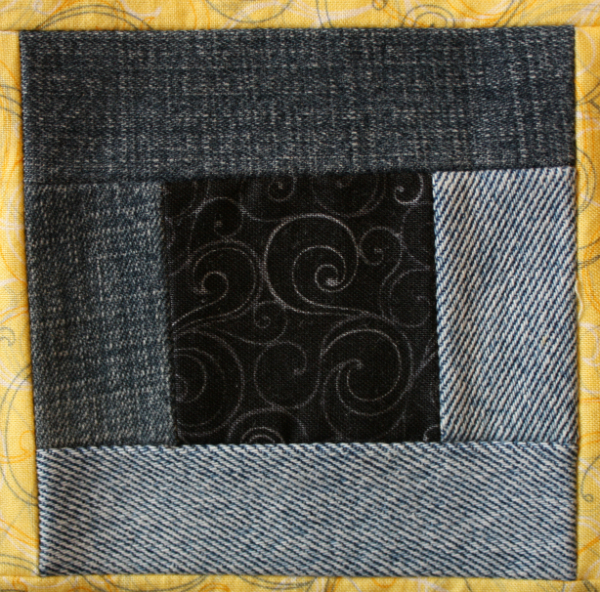 Stitch one denim 1 1/2" x 2 1/2" rectangle to each side of the black 2 1/2" square. 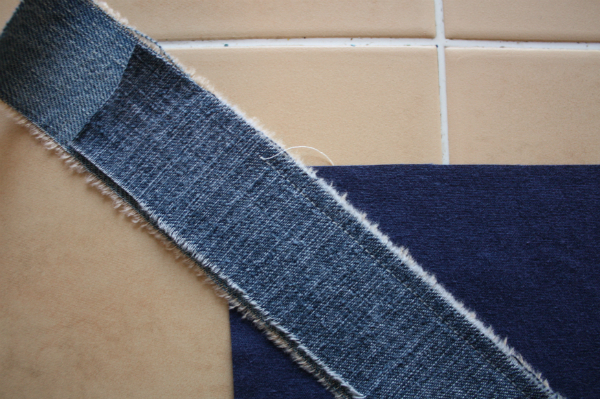 Then stitch one denim 1 1/2" x 4 1/2" rectangle to the top and bottom. At this point, you could trim to make sure everything stays perfectly square. I forgot to trim, which means my lines are not quite perfect, but they're pretty close. Whether you trim or not is entirely up to you. Stitch one yellow 1 1/2" x 4 1/2" rectangle to each side. Then stitch one yellow 1 1/2" x 6 1/2" rectangle to the top and bottom. Trim if you want. 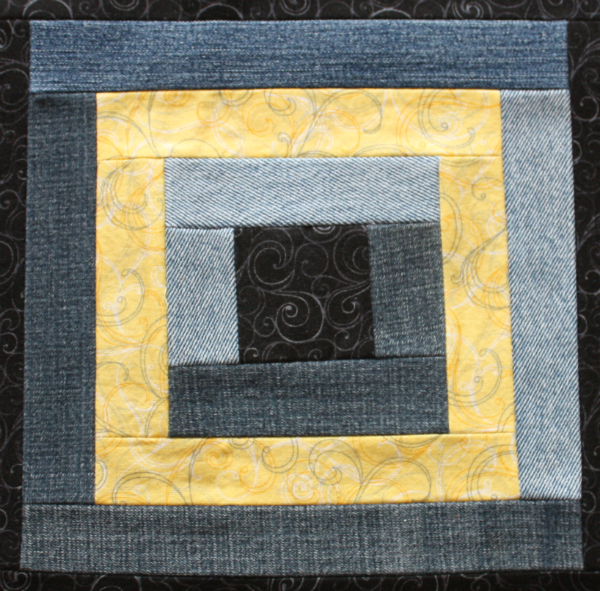 Stitch one denim 1 1/2" x 6 1/2" rectangle to each side. 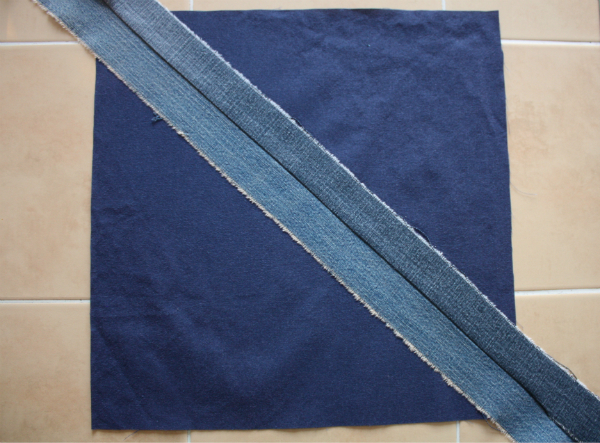 Then stitch one denim 1 1/2" x 8 1/2" rectangle to the top and bottom. Trim if you want. Stitch one black 3" x 8 1/2" rectangle to each side. 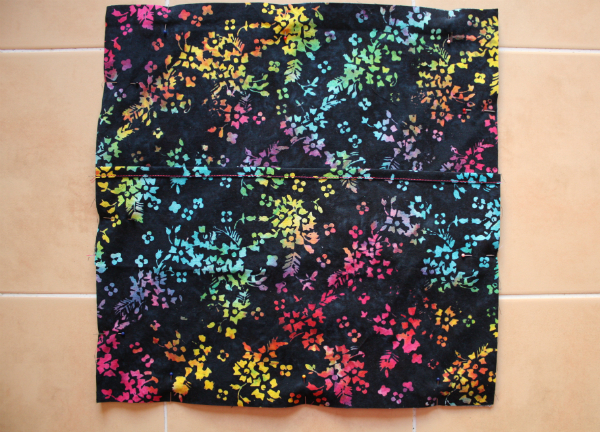 Then stitch one black 1 1/2" x 13 1/2" rectangle to the top and bottom. Trim if you want. 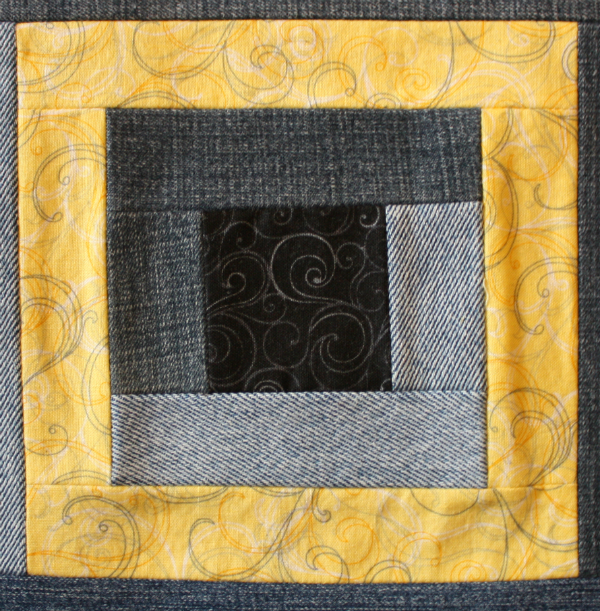 Stitch one denim 3" x 10 1/2" rectangle to each side. 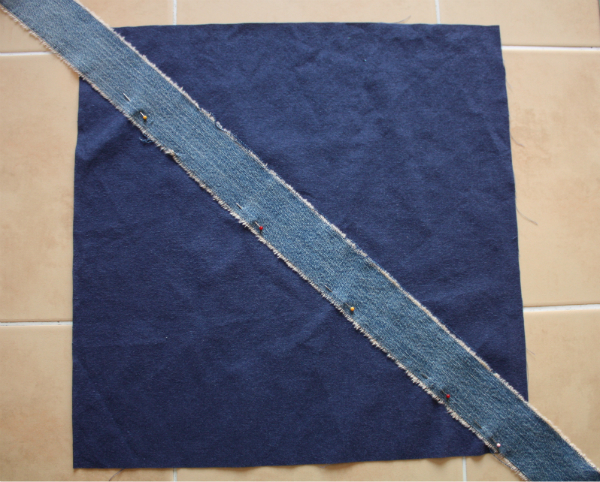 Then stitch one denim 1 1/2" x 18 1/2" rectangle to the top and bottom. Trim if you want. Layer the placemat top, batting and backing. Baste, then quilt as desired. 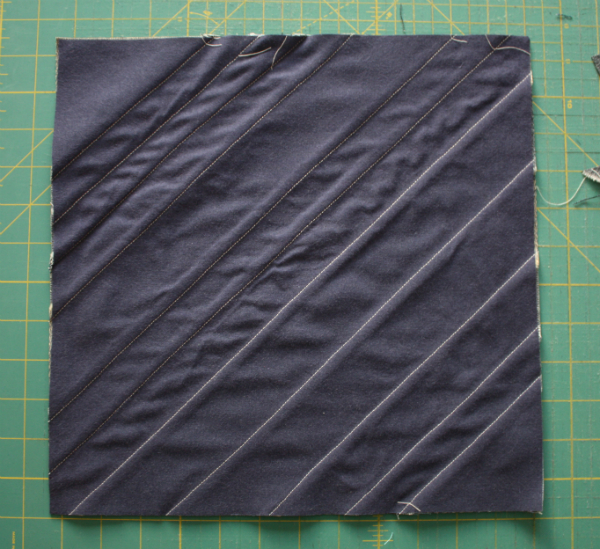 Free motion quilting on the denim worked quite well, even over the bulkier seams. I did find I had to go slower over those seams, but other than that there was no difference compared to quilting over regular cotton fabric. I used my regular needle and Connecting Threads 100% polyester thread (affiliate link). Join the 2 1/4" binding strips, then use them to bind the placemats. And that's it for Denim Days! I hope I've given you some ideas for using the denim stashed in a closet. After all, recycled denim is almost like having free fabric! I still have more denim ideas floating around in my head, so we may have to revisit Denim Days again sometime. 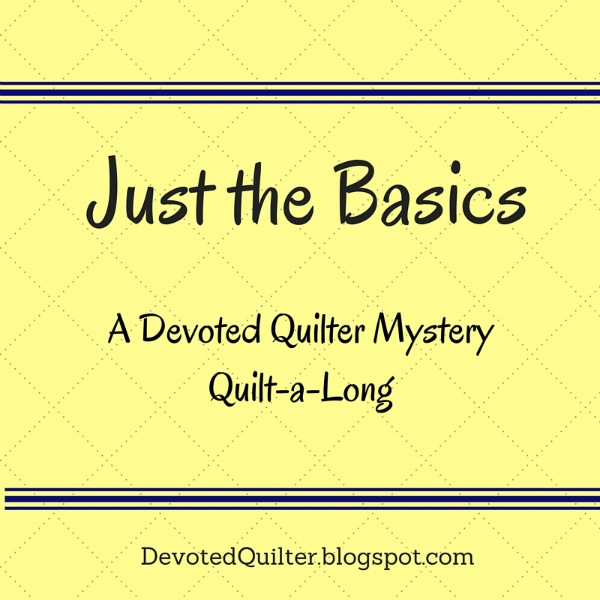 In the meantime, don't forget that my Just the Basics mystery quilt-a-long starts next Wednesday, March 2nd. The basics are anything but boring! To make sure you don't miss a post, you can follow by Bloglovin, feedly or by email. The links are all on my sidebar. * This post contains affiliate links. That means that if you click the link and then make a purchase I will receive a small commission. This does not affect the price you pay. Albert Einstein said, "Put your hand on a hot stove for a minute, and it seems like an hour. Sit with a pretty girl for an hour, and it seems like a minute. That's relativity." I thought of this one day last week when I was having issues with one of the boys I babysit. The non-nap portion of the day seemed like it would never end, while the nap seemed to pass in the blink of an eye. Have you ever had days like that? In the Bible, Peter tells us, "But do not forget this one thing, dear friends: With the Lord a day is like a thousand years, and a thousand years are like a day" (2 Peter 3:8). I thought about the verse while trying to get through that day that felt like it was approaching a thousand years. I couldn't help thinking, "Has God ever had what felt like a thousand-year-long day because of my disobedience? Like me with the little guy, I wonder if God ever watches us and thinks something along the lines of, "I have had to discipline her for this so many times. I wish she would just learn the lesson and change her behavior." Does He ever think, "Again? I just dealt with you about that sin." Or maybe there's a little more exasperation in His tone as He thinks, "Just give it up already! You know better than that!" That's not actually what Peter was talking about, though. In 2 Peter 3:3-7, Peter is talking about the 'last days' when people will make fun of those who believe in God's promise that Jesus would return. These scoffers, as Peter calls them, would claim that ever since the beginning of time, life has gone on as usual, so where is this coming that was promised? Of course, Peter tells us, these people are forgetting God's power and that He is different from men. Then Peter reminds his readers, and us, "But do not forget this one thing, dear friends: With the Lord a day is like a thousand years, and a thousand years are like a day" (v.8). In other words, you might think it's taking a long time for Jesus to come back, or that it has been so long that God has surely forgotten about the promise, but that's not the case at all. Peter is reminding his readers, and us, that, since God is outside of time, time has no meaning for Him and therefore trying to hold Him to some sort of man-made schedule really doesn't work. Then comes one of my favourite verses in the whole Bible. "The Lord is not slow in keeping his promise, as some understand slowness. Instead he is patient with you, not wanting anyone to perish, but everyone to come to repentance" (v. 9). 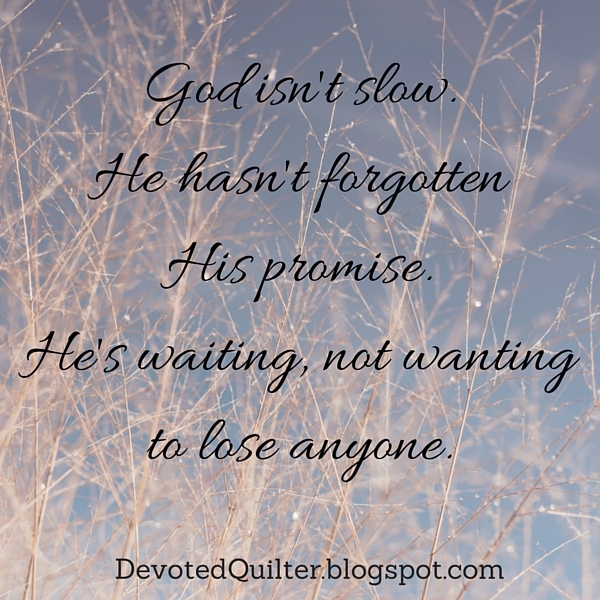 God isn't slow. He hasn't forgotten about His promise. He will come back, but He is waiting, not wanting to lose anyone for eternity. There are many, many people who have not yet accepted Jesus as their Savior. Many, many people who, if Jesus comes back now, will perish for eternity. God is being patient, giving those people time to realize how much they need Him. God's patience, and His perfect timing, might look slow to us, but that's only because we're still thinking in terms of time. God is looking at all of eternity, and a thousand years of waiting means nothing to Him when compared to the people who will come to Him in that time. Welcome back for week 3 of Denim Days! Every Friday in February I'm sharing ideas for using up the seemingly never-ending supply of old jeans you may have tucked away in a closet, if you're anything like me. The best part about using old jeans for sewing projects? It's like having free fabric! Click these links to see my posts from week 1 and week 2. 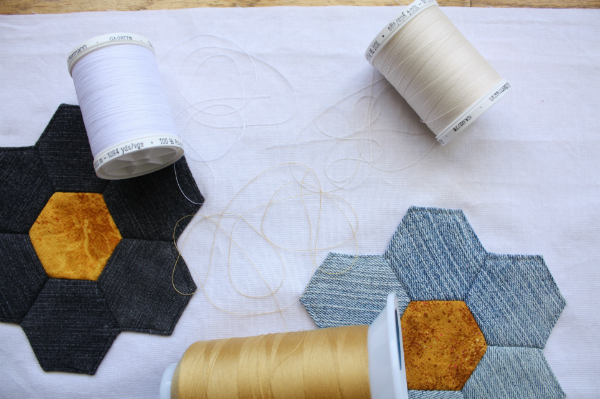 When I was first thinking about doing a series of projects with denim, I wondered if it would be possible to do English Paper Piecing with denim. 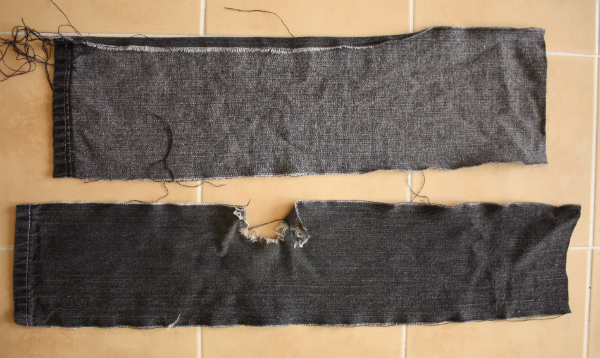 Would it be too hard to hand stitch through the denim long enough to actually make something? Denim is a lot thicker than quilting cotton, after all. 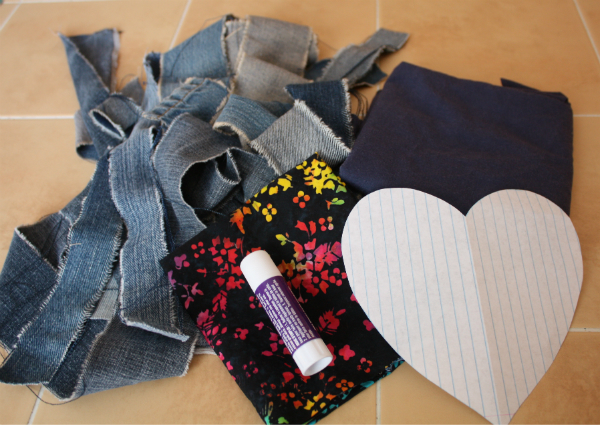 Turns out, you can do EPP with denim! Not only that, but the thickness of the denim really doesn't affect the effort it takes to stitch. Sometimes, at the corners, it was a little harder to get the needle through, but other than that I didn't find any difference. 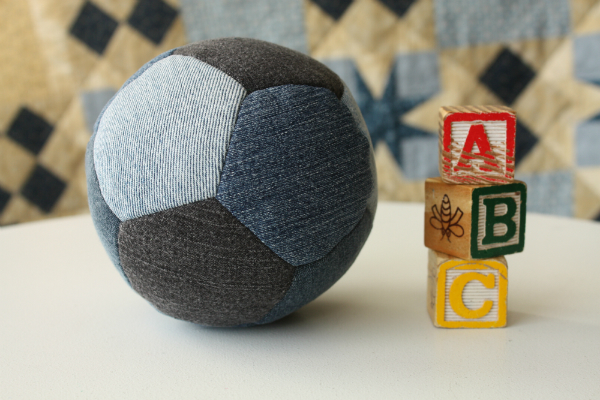 The first denim EPP project I made was a ball. Before Christmas I made a pentagon ball following the tutorial by Rob Appell of Man Sewing. To be honest, I really wasn't happy with it. It was sewn on the machine and I didn't think the intersections between the pentagons turned out as neat as they could have. I also found that as I stuffed the ball the fabrics at the opening frayed and that made it hard to stitch the opening closed neatly. So, for my denim version, I used the EPP templates provided by Abby at While She Naps. Because it's EPP, the intersections are so much neater! Plus, the edges of the opening were already basted down, so they didn't fray while I stuffed the ball, and stitching it closed was much easier. A bunch of kids were playing with the ball last night and one of them was amazed by how soft it was. There's nothing quite like well worn denim, is there? 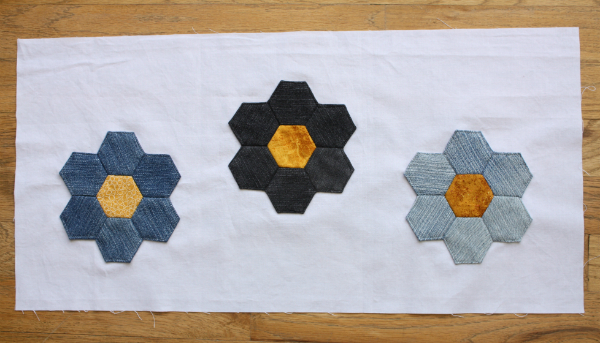 I couldn't resist make some hexagon flowers out of denim too. The centers are regular quilting cotton. These are 1" hexagons, which I printed from Incompetech. Their site makes it quick and easy to make templates in any size. I would recommend printing your templates on cardstock. That's what I did for the pentagon templates, but I forgot for the hexagons and printed them on regular printer paper. 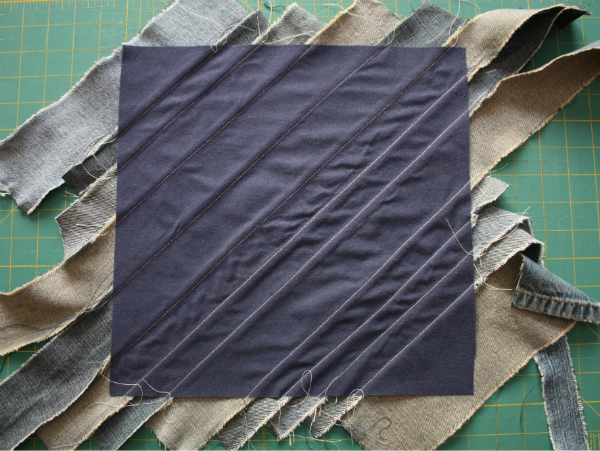 While I find regular paper fine for quilting cotton, I found it felt really flimsy with denim and I worried that I'd fold the edges of the paper when I folded the denim over to baste it. The cardstock felt much sturdier and didn't bend at all. I used matching thread to machine applique the flowers to a white background. 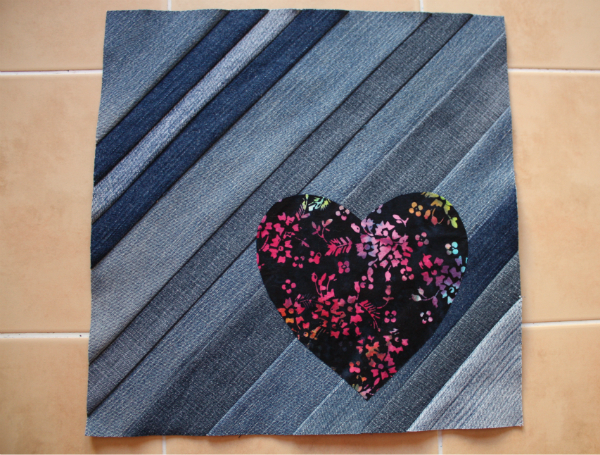 I plan to do Flow Quilting all over the background, but I haven't decided what colour thread to use. 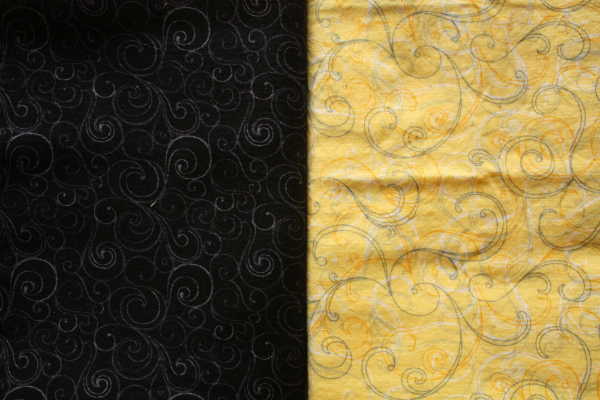 I'm considering white (which would blend in completely), cream (which would almost blend in completely, but would be a little easier to see as I stitch), or yellow (which would make the quilting stand out). What do you think? 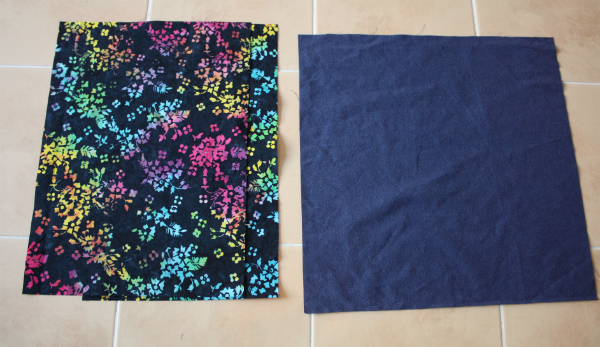 I have special plans for this mini quilt, so stay tuned! It's hard to believe there's only one week left in February! I'll be back next Friday with the last Denim Days post. I really enjoy teaching people to quilt. Partly it's because I love quilting so much, but a lot of the fun comes from seeing how excited they are as they see their progress. It's fun to see how amazed they are that they're making a quilt, and it actually looks like it's supposed to! For the past couple of weeks, I've been teaching my friend Michelle and she's now ready to put the binding on her table runner. When her husband told me that he thinks she's been bitten by the quilting bug, I said, "Then my evil plan is working...Get her good and addicted so I'll have someone to quilt with!" You don't need to be an expert in order to teach someone one how to quilt. 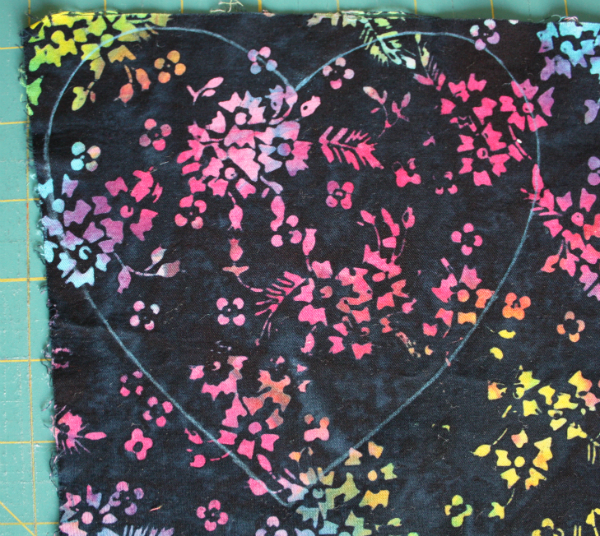 You certainly don't have to wait until your own quilts are perfect, or no one would be teaching! As long as you understand the basics (rotary cutting, 1/4" seam and binding, I'll say), you can introduce someone else to the joys of making quilts. You don't need to be an expert to teach others about Jesus either, but we often feel we're not qualified. We want the pastors be the ones to tell people about Jesus, and to make disciples. After all, it's their job, right? Actually, no. According to Ephesians 4:11-13, "So Christ himself gave the apostles, the prophets, the evangelists, the pastors and teachers, to equip his people for works of service, so that the body of Christ may be built up until we all reach unity in the faith and in the knowledge of the Son of God and become mature, attaining to the whole measure of the fullness of Christ." To equip his people for works of service, so that the body of Christ may be built up. The work of the pastor is to build up the people, so that they are prepared to do the work God has designed them to do. And what is that work? Jesus' Great Commission (in Matthew 28:19, 20), says, "Therefore go and make disciples of all nations, baptizing them in the name of the Father and of the Son and of the Holy Spirit, and teaching them to obey everything I have commanded you." This command was given to Jesus' disciples and, by extension, to all of those who would come after them. 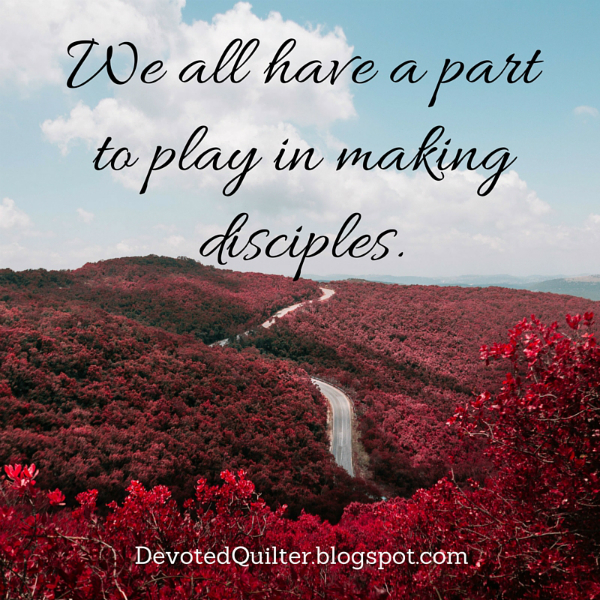 We all have a part to play in making disciples. We don't have to be great theologians or trained missionaries in order to make disciples. We also don't have to have all the answers or have perfect lives, or no one would ever make a single disciple! We just have to be willing to share what we know about Jesus with the people we meet as we go about our daily lives. Being willing to answer a question, or offering to pray when needed could go a long way in turning someone's heart towards God. Welcome back to TGIFF! I hope you have some fun finishes to link up this week! This is week 2 of Denim Days, where I am sharing ideas for how to use the (kind of) free fabric you may have stashed in a closet. I'm talking, of course, about old jeans! 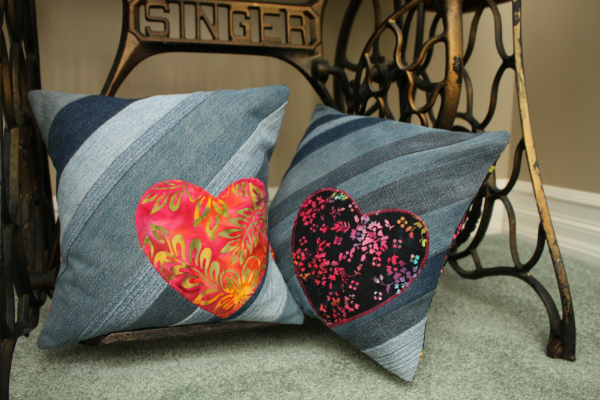 Every Friday in February I'll be sharing a project or two using recycled denim. To see last week's projects, click here. 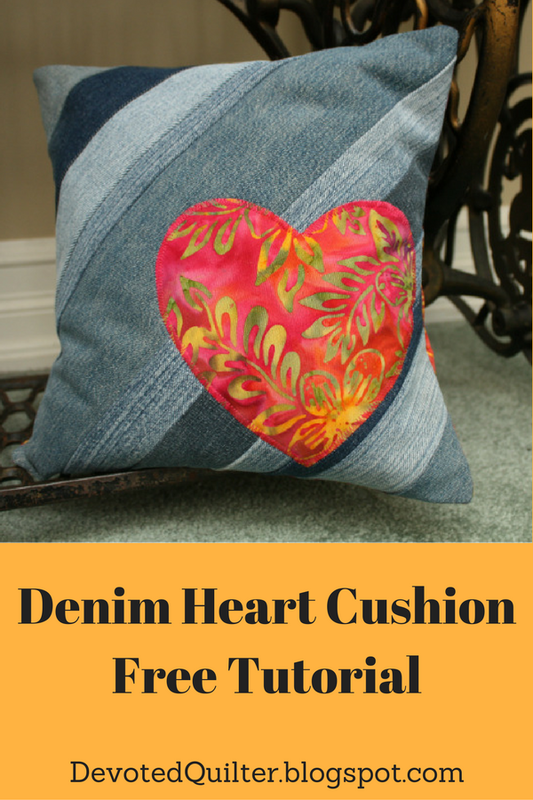 This week I have a tutorial for a cute and quick cushion cover. * Old jeans in a variety of colours (my jeans were already torn into strips when I took this picture). * a piece of fabric for the foundation. This will not be seen, so it doesn't matter if it matches or not. To deconstruct the jeans, make a cut on either side of each of the leg seams. Rip all the way up the leg, then cut across the top. As you can see, this is a great way to use jeans that have holes in the knees! To make the strips, simply measure across the bottom as wide as you want the strip to be and make a cut, then rip again. Make a bunch of strips in a variety of widths (I used 12 strips for one cushion and 11 for the other). Press the strips and trim off the loose threads. 2 rectangles 12 1/2" x 9" from the print. 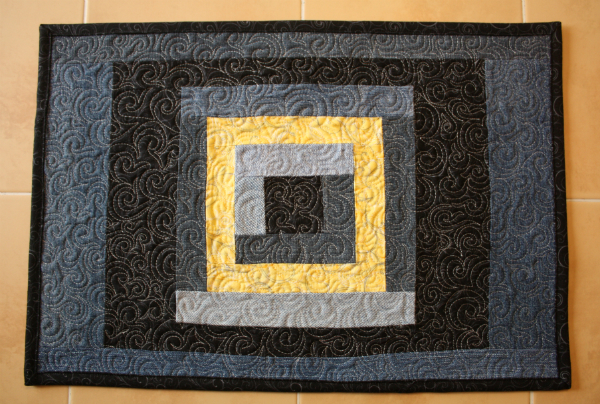 One of my fat quarters was not quite the standard 18" width so I cut one of the rectangles at 8". There's a little less overlap at the back of the cushion, but it looks fine. 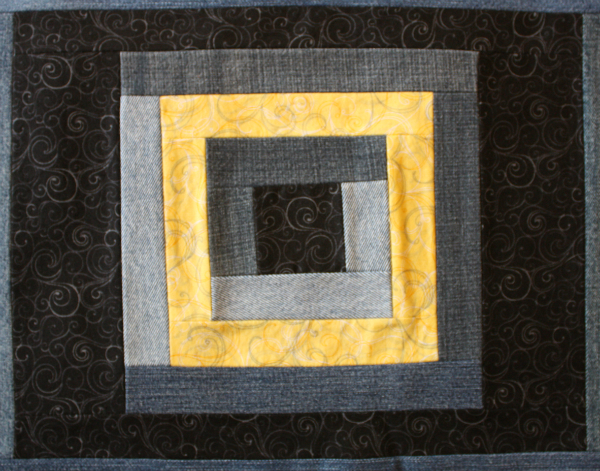 1 square 12 1/2" x 12 1/2" from the foundation fabric. Lay the foundation square on your work surface. Take one long strip of denim and lay it diagonally across the middle of the square, right side up. Make sure it extends past the corners. Pin along one edge. Lay another long strip on top, right sides together, and align the edge away from the pins. 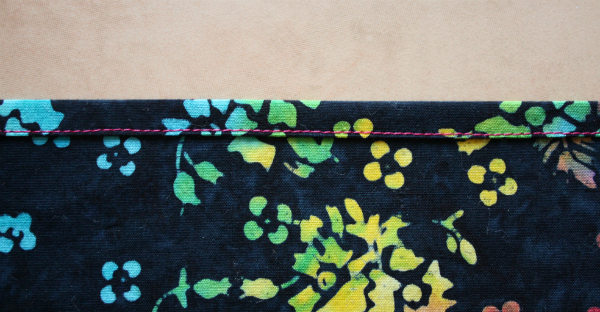 Stitch, using a 1/4" seam, and making sure your stitches extend past the foundation square. Continue adding strips until the entire foundation square is covered. To make this part even faster, I added a strip to each side before going to press the strips open. Be sure to use wide strips in the corners so you won't have to deal with any extra bulk in the corners from seam allowances when you're finishing the cushion. When the whole foundation square is covered, lay the piece right side down on your cutting mat. 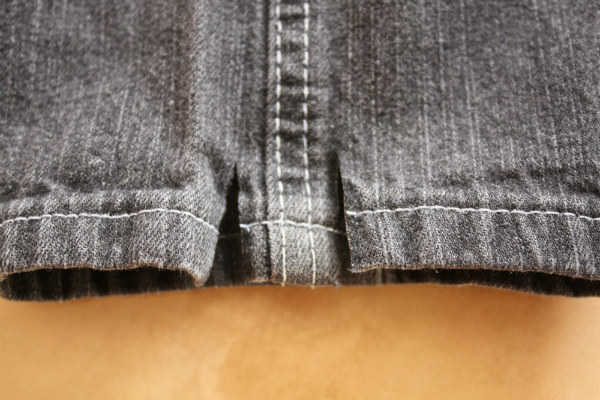 Using a long ruler, trim the excess denim even with the foundation. 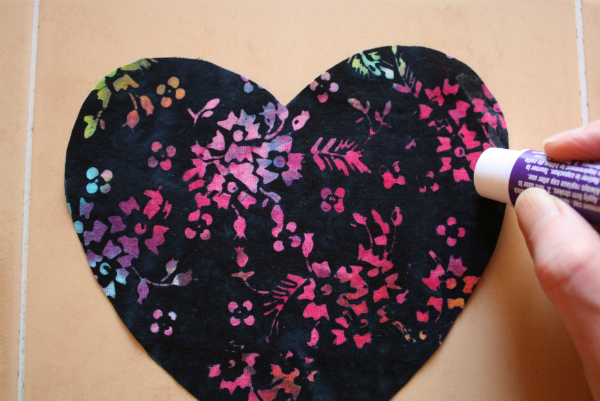 Trace around the heart template on the print, then cut it out. Use the glue stick to make a line of glue along the edge of the wrong side of the heart. Be careful not to stretch the bias edges of the fabric. Position the heart near the bottom right of the cushion front. Press with a hot, dry iron to set the glue. 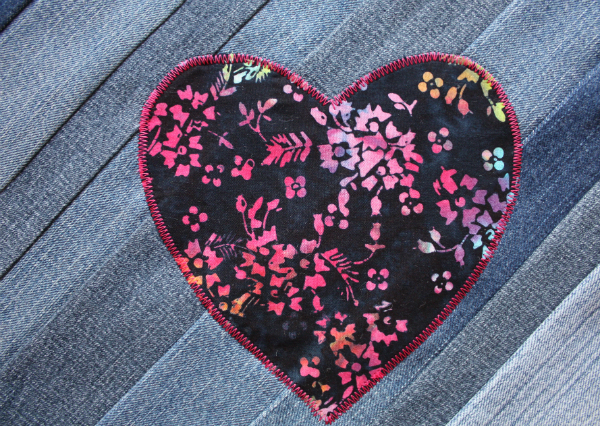 Using thread to either match or contrast with the fabric, stitch around the heart. 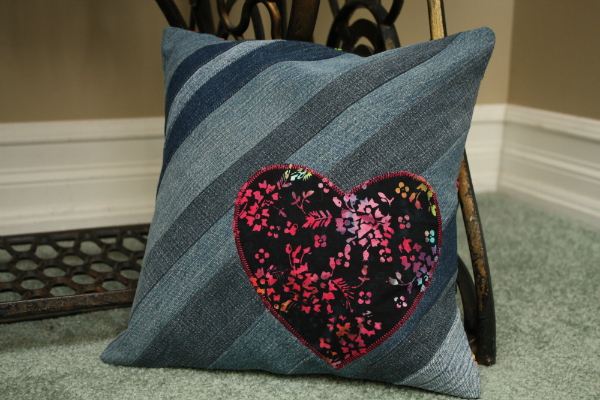 I used a zig zag stitch, but you could also use just a straight stitch or a blanket stitch. On one long side of each of the print 12 1/2" x 9" rectangles, fold 1/4" towards the wrong side and press. Then fold over 1/4" again and press. Stitch close to the folded edge. Lay the cushion front on your work surface, right side up. Position one of the print rectangles on top, right sides together and matching up the raw edges. Position the other print rectangle on top, again right sides together with the cushion cover and matching up the raw edges. The finished edges of the rectangles will overlap across the middle of the cushion front. Pin in place. Stitch all the way around with a 1/4" seam. Clip the corners and turn the cushion cover right side out through the opening in the back. 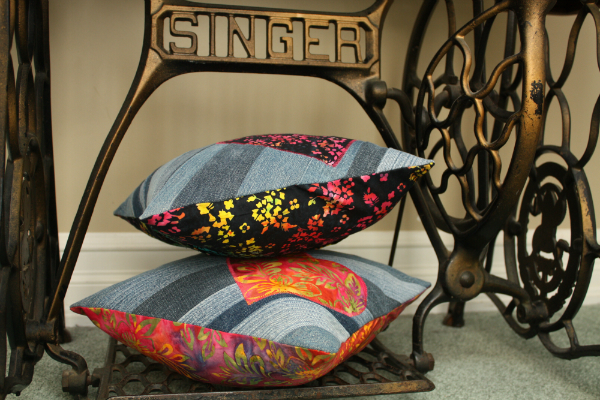 Give it a good press, put in a 12" cushion insert and you're done! I think these would look cute with other applique designs too, like a flower or a letter for a monogram. Now it's your turn! What have you finished this week? Remember to visit a few of the other links and celebrate what others have finished too. 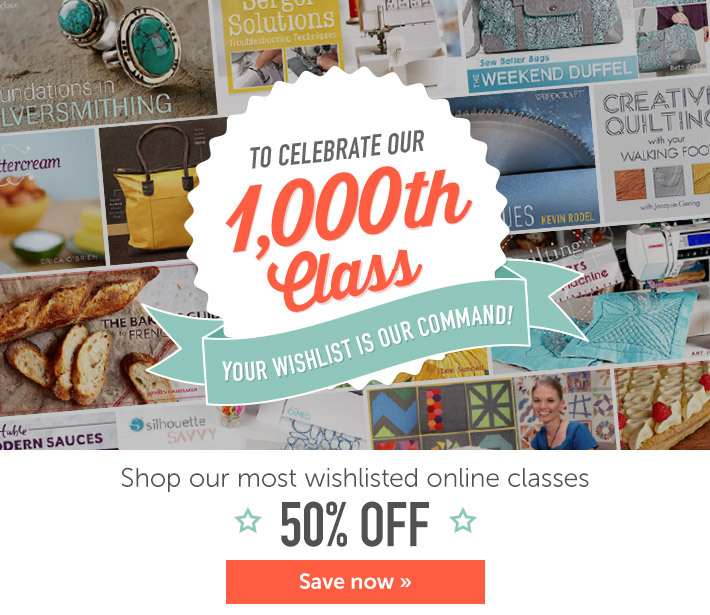 Just popping in to let you know that Craftsy is celebrating their 1000th class by offering their most wishlisted classes for 50% off until Thursday. There are 201 classes included in the sale, including classes by Jacquie Gering, Christina Cameli, Angela Walters, Jenny Doan and Leah Day. And that's just the quilting classes. There are also classes in sewing, drawing, photography, cooking, woodworking, cake decorating, painting, knitting...Is it any wonder they have 1000 classes available? The Sewing with Knits class is also included, if any of you want to join in with me for my 2016 Challenge. I've watched the first few lessons and I'm really enjoying it. I was watching it this morning, actually, while trimming a big pile of HSTs. Now it's just a matter of laying my hands on some fabric and actually trying it! I've said before that I'm a huge fan of Craftsy's classes, which is why I have no problem promoting them. I have 12 classes on my own wishlist, and I'm sure I could add a bunch more considering all the new classes they've offered since I last updated my list. *This post contains affiliate links, which means that if you click on a link, then make a purchase, I will receive a small commission on the sale. This does not affect the price you pay. Sarah at Confessions of a Fabric Addict writes a series of posts she calls What's on the Bookshelf Wednesdays, in which she shares a book from (you guessed it) her bookshelf. Some are new books, some are older and almost all of them are sewing related. A couple of weeks ago, though, she shared a book by Kristen Welch called Raising Grateful Kids in an Entitled World. I had never heard of Kristen, but Sarah's review was quite thought-provoking, so I clicked over to Kristen's blog, We are THAT Family, to learn more. I highly recommend the blog, and spent a good bit of time there, poking around and reading posts. I don't have the book (it's definitely on my wishlist), but in reading Kristen's blog and the posts of other bloggers who reviewed her book, it became obvious that Kristen's theory is that kids today feel entitled because we, the parents, feel entitled too. That gave me a lot to think about over the past week and a bit. Entitled means "believing oneself to be inherently deserving of privileges or special treatment." Very few, if any, of us would say we feel we deserve special treatment. In fact, my immediate reaction was to think "Not me!" However, Kristen sets entitlement opposite gratitude, so that every moment we complain about the things we don't have, or the job we have to do even though we hate it, and every time we get annoyed at someone for inconveniencing us, those moments are all symptoms of our feelings of entitlement. They're a sign that we feel, however subtly, that we should have everything we want and we should only have to do the things we want to do. I don't know about you, but I have to admit I've had those feelings at times, rather more often than I care to admit even. Unfortunately, these thoughts go directly against how God wants us to think. The Bible tells us, "Do nothing out of selfish ambition or vain conceit. Rather, in humility value others above yourselves, not looking to your own interests but each of you to the interests of the others" (Philippians 2:3,4). That sounds like pretty much the opposite of feeling entitled, doesn't it? It also sounds hard. Since reading Sarah's review of the book and then reading some of Kristen's blog, I've been noticing just how often those kinds of entitled thoughts cross my mind. It's not pretty. We are naturally selfish creatures, and those natural tendencies do not just go away when we become Christian. If only it were that easy! Humility means "a modest or low view of one's own importance," which sounds much more like what God wants for me. Not that He doesn't think that I'm important, (see just how worthy He thinks we are), but He doesn't want us to have an inflated opinion of ourselves. In humility, we value others about ourselves, which is much easier to do if we aren't stuck in a pattern of thinking too much of ourselves. With that humility, it's also easier to be concerned about the interests of others rather than always thinking about ourselves. Thankfully, we don't have to make this change in attitude alone. In Romans 8:5, Paul wrote, "Those who live according to the flesh have their minds set on what the flesh desires; but those who live in accordance with the Spirit have their minds set on what the Spirit desires." 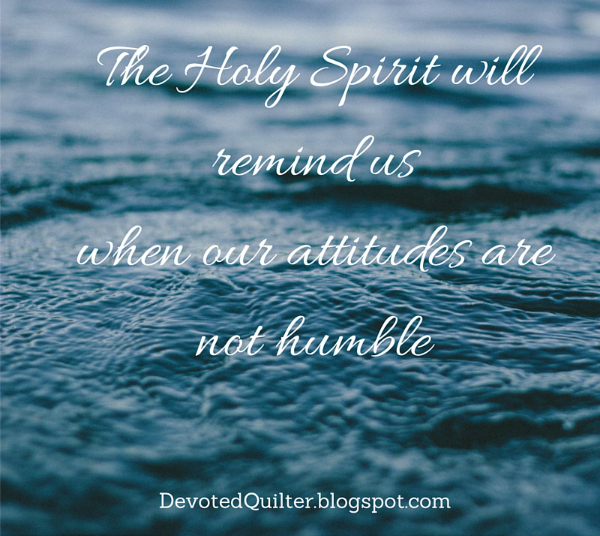 If we are willing to listen, the Holy Spirit will remind us when our attitudes are not humble, and when a feeling of entitlement is rearing its ugly head. If our minds are set on what the Spirit desires, then when He prompts us to make changes in our attitudes, we will be willing to listen and, most importantly, to respond. Then we will trade feelings of entitlement for feelings of gratitude and a spirit of service to others. TGIFF - Introducing Denim Days! I'm a bit of a packrat, and I've had a closet full of old jeans for years. I didn't know what I was going to use them for, but I certainly wasn't about to throw them out - all that denim is like free fabric, after all! To be honest, part of why I wasn't using the jeans was the simple fact that I didn't want to deconstruct them into usable pieces. 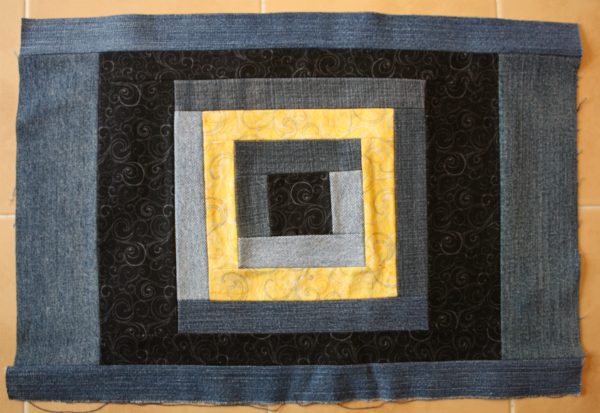 I made a denim quilt for my brother back in 2000 and taking all those jeans apart was a real pain in the behind hand. Cutting denim with scissors is hard work! I was in between projects in early January and waiting for fabric to come in the mail, so I started playing with some of that denim I've been hoarding. The result is a whole series of projects, which I'll be sharing every Friday in February. I'm calling it Denim Days. Each Friday this month I'll share a project or two. Some will be my own designs and I'll include tutorials, while others will be projects I've made using someone else's tutorial. All of them will help you use up any old jeans you have lying around. If you don't have old jeans lying around, thrift stores are a great source, or ask friends (especially friends who have kids) to donate their old jeans to a good cause -your awesome sewing projects! Without further ado, here are my projects for today. 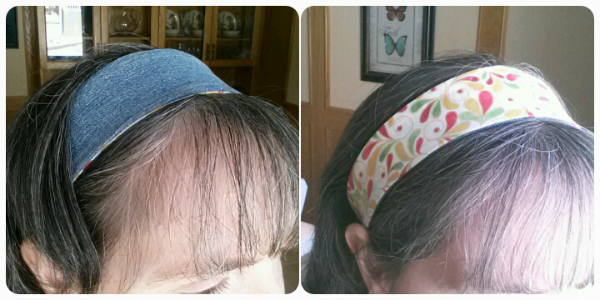 The first one is a reversible headband I made using this tutorial by Vanessa of Crafty Gemini Creates. Vanessa uses quilting cotton for both sides of her headband, but I was already in "What else can I make out of denim?" mode when I decided to make mine, so I decided to try using denim for one side. The tutorial recommends Shape Flex, which I didn't have, but I did have some fusible interfacing lying around, so I used that on the quilting cotton. I didn't bother to use any on the denim side because I figured it would be stiff enough without it, and I was right. It's perfect! Using the denim did make it a little harder to turn the headband right side out, but it was still doable. The whole project only took about 20 minutes, including making the template, and now when my hair is getting on my nerves, I can get it out of my face. Yippee! As a bonus, denim goes with pretty much everything. 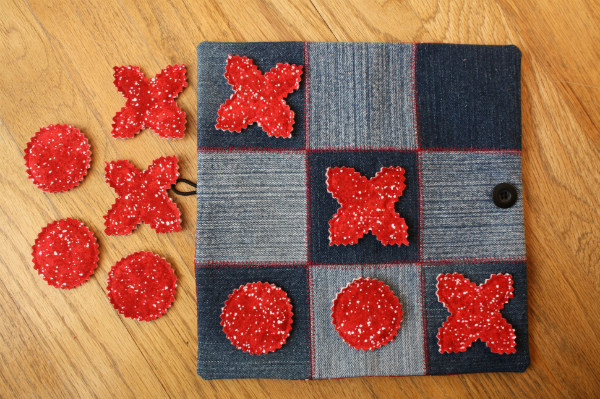 When I was making the Travel Tic Tac Toe Games that I gave as Christmas gifts, I was already thinking that it would be fun to make a couple using denim for the 9 patch block for the game board, so these were the first things I made after tearing apart some of those old jeans. I really love how they turned out! Instead of stitching in the ditch around the 9 patch block, I used red thread and a tight zig zag stitch to really emphasize the divisions between the squares. Other than that, I followed the instructions in my tutorial completely. 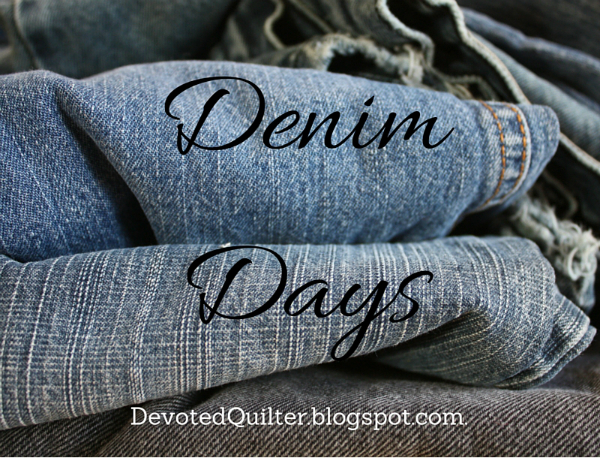 I hope you'll come back every Friday this month to see what else I'll be sharing for Denim Days! I'm really excited about the projects :) Also, my Just the Basics mystery quilt-a-long will begin in March, so be sure to follow me if you're interested in that! You can find the links for following by Bloglovin, email, Feedly and Instagram in my sidebar. Now it's your turn! Link up to show off your finishes, then go visit a few of the other links and don't forget to leave comments. It's only a party if we interact with each other, right? Are you familiar with Compassion International? They are a child-sponsorship organization whose motto states they are "releasing children from poverty in Jesus' name." Right now there is a team of Compassion bloggers in Ecuador, meeting sponsored children and seeing firsthand the amazing work being done in their lives. They're blogging about their experiences each day and you can read those posts here, or just click on the image. Some of the stories are really beautiful, this one especially! While you're reading, would you consider sponsoring a child? For only $38 a month, you can help a child move beyond their poverty and reach for dreams that wouldn't otherwise be possible. My father-in-law is a pastor and for a while they lived and pastored here in the same small town where Paul and I now live. They moved away about a year before we arrived, though, so we didn't live here at the same time. When we first got here, we were often amused by how we were introduced because almost every introduction was the same, "This is Pastor Parsons' son and daughter-in-law." It happened in the church, of course, since Pastor Parsons had been their pastor only a year ago, but it also happened all around town. Paul's father was well known, and well liked, so many people connected us to him. The Bible says, "A good name is more desirable than great riches; to be esteemed is better than silver or gold" (Proverbs 22:1). A good name simply means a good reputation, being known for good things rather than being known for being rude or impatient or mean. A good name is not necessarily earned by one great act of kindness, but rather over many, many little interactions with the people in our communities. Because I live in a small town, I know most of the store cashiers by name, and they know me. I chat with the ladies at the post office when I go in to check my mail, and once even opened a package before leaving so that one of them could see my Round Trip Quilt when it came home to me. It is obvious that my interactions around town affect how people see me. That may not seem to be the case for you, especially if you live in a big city. But even though you may see a different cashier every time you go to the store, there are other people with whom you have those small, daily interactions that allow them to form an opinion of your character. Of course, as believers, it's not only our own names that are affected by how we treat the people we interact with. While talking about how God works through believers to reconcile other people to Him, Paul wrote, "We are therefore Christ’s ambassadors, as though God were making his appeal through us" (2 Corinthians 5:20). An ambassador is an official representative of his or her home country to another country and, as such, they present their entire country to people who may never meet another person from that home country. For example, if the Canadian ambassador to France were to start acting rude and arrogant, he or she would create a poor impression among the French, not only of his or her own character, but also of all Canadians. 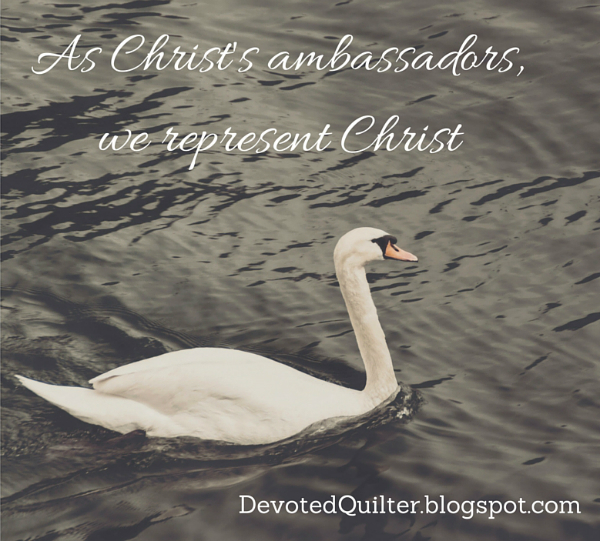 So, as Christ's ambassadors, we represent Christ. Those actions that hurt our name in our community also hurt His name. Those things that build up our good name, also build His good name. In order to represent Christ properly, we must live as Christ would live. Fortunately, in the book of Micah, we are given a simple formula for living God's way. "He has shown you, O mortal, what is good. And what does the Lord require of you? To act justly and to love mercy and to walk humbly with your God" (Micah 6:8). To act justly - to do what is right. To love mercy - to show love and kindness, even at times when it isn't deserved. To walk humbly with your God - First up, to walk with God, having an ongoing relationship with Him, and then also to remember that we are not perfect, that we often need God's mercy, and that He willingly gives it to us because of our faith in Jesus. If our lives are characterized by those three things, then we will earn a good name in the community, and be good ambassadors for the One we represent.